The women who had been dizzy and afraid to face the advent of menopause do not have to wonder anymore. Hot flushes and sweating constantly attack can be overcome or at least reduced. Only with yoga you can do it. 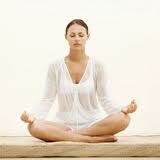 Even yoga is said to improve mental function. As stated by the scientists of India. To investigate whether yoga can help women who are menopausal and experiencing physical and cognitive symptoms, scientists randomly assigned 120 postmenopausal women aged 40 to 55 years. They were asked to do yoga or simple stretching and muscle strengthening exercises five days a week for a period of eight consecutive weeks. Postures, breathing and meditation in yoga, "Having one common effect, by affecting the mind that makes a person become calm," said the scientists. The women in the yoga group also listened to lectures on using yoga to manage stress and other yoga-related topics. While those in the control group heard lectures on diet, exercise, the physiology of menopause, and stress. After eight weeks, women in the yoga group showed a significant reduction in their body. Sense of body heat and sweat at night decreases symptoms. While those in the control group did not experience this. This was stated by Dr R Chattha of Swami Vivekananda Yoga Anusandhana Samsthana in Bangalore, India. Although both groups showed improvements in a test of attention and concentration, the yoga group showed significant progress. Of the 10 components of memory and intelligence tests, 8 points earned by those in the yoga group, while the control group only six. Improvements were significantly greater in the yoga group compared to the control group on seven subjects. "This study shows the superiority of yoga. This also means showing that physical activity also improves cognitive function with an emphasis on proper breathing, synchronizing breathing with body movements, relaxation and mindful rest," said the scientists.